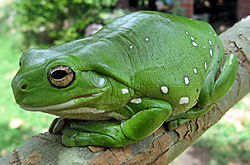 Frogs are smooth-skinned, web-footed, tailless, leaping amphibians belonging to the order Anura. The word frog traces back through the Medieval English word frogge, to Old Norse frauki, to the Sanskrit words pravate (meaning "he jumps up") and plava ("frog"). In essence, the word frog has the meaning of "jumping, hopping". In its narrowest sense, the word applies only to members of the family Ranidae — true frogs. But it is used more widely to distinguish the smooth-skinned, leaping amphibians from the squat, hopping, warty toads. The Bible records a plague of frogs as the second of the 10 plagues of Egypt (Exodus 8:2). As mainly water creatures, frogs were created on the fifth day of the Creation Week. Most frogs have protruding eyes and a smooth moist skin. The Creator has also equipped them with strong, webbed hind feet that are ideal for leaping and swimming. Edible frogs rely on camouflage to protect them — either blending their colors into the background, or changing color. Several species have colors on their underparts that appear to flash when the frog moves, distracting potential predators. The smallest frog in the southern hemisphere is the Brazilian gold frog (Brachycephalus didactylus, formerly known as Psyllophryne didactyla). Adult gold frogs grow to less than one centimetre (about 3/8 of an inch) with their legs drawn in. Recently, in 2010, a new record holder for the smallest frog in the Old World was found in Borneo and mentioned by Todd Wood. The Microhyla nepenthicola was found in a miniature pitcher plant of the Nepenthes ampullaria species. Its adult males have a snout-vent length of between 10.6 - 12.8 mm. The genus Microhylidae was first identified in 1838 and presently has about 30 known species.. The largest frog known is the African goliath frog (Conrana goliath). According to the Guinness Book of Records, a captured goliath frog (which Guinness identifies as Conraua instead of Conrana) measured 36.8 centimetres (14.5 inches with its legs extended) when captured in 1889. With rare exceptions, frogs and toads have external fertilization. Frogs lay eggs yearly, usually in fresh water. Because frogs' eggs do not have shells, the frog has to lay them in moist areas. She may lay hundreds or thousands of eggs in clusters covered by a gelatinous matrix. When the eggs hatch after several days, the tailed, gilled, limbless tadpoles appear, which later turn into four-limbed adults without tails or gills. 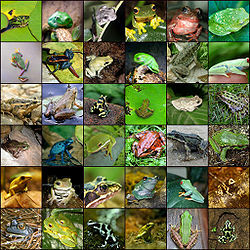 Frogs are largely aquatic, and feed on insects, worms, small fish, and other small water dwellers. Some eat other frogs and small rodents. Some frogs live on land, in trees, or in burrows. The main concern of most frogs, as with most amphibians, is moisture to stop their smooth, scale-free skin from drying out. Toads are usually found on land, but even so they spend most of the day in their burrows and spend nights where there is surface moisture. The family of true frogs, Ranidae, live on all major land masses except Antarctica, Greenland, and New Zealand. The main reference to frogs in the Bible is in Exodus 8. This chapter begins with a description of the second plague on Egypt in response to Moses’ attempt to persuade the hard-hearted Pharaoh to let God’s people go. Pharaoh refused Moses, so God sent a plague of frogs on the land. Large numbers of frogs regularly appeared after the Nile receded in mid-December. They were a symbol of fertility. But in the plague God sent, the frogs swarmed up from the Nile in such numbers that they were overwhelming. They swarmed into houses, under beds, into ovens and into kneading bowls. The Egyptian magicians, who tried to replicate the plagues to show their power, made matters worse. Instead of showing they had the power to get rid of the frogs, they only managed to make more frogs appear. Another biblical reference to frogs is in Revelation 16:13. In this passage, John the Apostle has a vision of three unclean spirits like frogs coming out of the mouth of the "dragon" (Satan). It does not say the spirits are frogs, but are like frogs — perhaps croaking clamorously as they try to spread their lies and deception one final time. African sedge frogs (Hyperolius) have adhesive toe disks that help them climb. The male hairy frog (Astylosternus robustus) from Cameroon has fine, hairlike filaments on its upper legs that help it breathe through the skin. The Japanese dagger frog (Babina holsti) has sharp, dagger-like thumbs. Asian gliding frogs (Rhacophorus) live in trees and have wide webbing between their fingers and toes that helps them glide up to 15 metres (50 feet). The Wood Frog, (Rana sylvatica) from the Ranidae family, is the only frog found north of the Arctic Circle. It is able to freeze completely solid in the winter and survive to thaw out in the spring. It does this (if the freezing happens slowly enough) by secreting extra glucose to protect bodily organs and letting water from its body accumulate in abdominal spaces where its expansion when frozen will not disrupt tissues. It is interesting to think of how this could have evolved. ↑ Spme Frog OdourSolid Phase Microextraction Janusz Pawliszyn. ↑ What is the Smallest Frog? ↑ Frog Monitoring Kondalilla National Park, Queensland Government. Accessed 26 August 2010. This page was last modified on 27 July 2014, at 16:56.